The names of the most conspicuous actors are as follows, viz: Mr. John Brown, Captains Abraham Whipple, John B. Hopkins, Benjamin Dunn, and five others, whose names I have forgotten, and John Mawney, Benjamin Page, Joseph Bucklin, and Turpin Smith, my youthful companions, all of whom are dead, I believe, every man of the party, excepting myself, and my age is eighty-six years this 29th day of August, eighteen hundred and thirty-nine. Robinson Revolutionary Fire: The Gaspee Incident, cites that this Turpin Smith from Providence was later a prominent shipmaster. For many years after the Revolution four survivors of the 'Gaspee' affair were conspicuous figures on all patriotic occasions in Providence, invariably appearing in Fourth of July parades. These four men were Turpin Smith, Ephraim Bowen, Benjamin Page, and John Mawney. The four Gaspee veterans - Colonel Ephraim Bowen, Jr., Captain Benjamin Page, Colonel John Mawney, and Captain Turpin Smith - rode in "a splendid equipage, an elegant barouche drawn by four spirited white horses." From: Williams, Catherine, Biography of Revolutionary Heroes: Containing the Life of Brigadier Gen. William Barton and also of Captain Stephen Olney. Providence, Published by the author, 1839, pp 19-24. The name of Turpin Smith, so far as we know, is unique to himself and his sons, one of which died at 6 months age, and the other born in 1788 that we know nothing further about. Turpin must have been his real and legal first name, for he used it on his application in 1833 for a pension based on his service in the Revolutionary War.. Following convention at the time, Turpin was possibly his mother's maiden name. Right: 1826 parade banner depicting the burning of the Gaspee. Surrounding the picture are the names of the four then 'surviving captors' who participated in the raid who were being celebrated: B. Page, E. Bowen, T. Smith, and J. Mawney. Courtesy of RI Historical Society RHiX17317. Click image to enlarge. He is buried at the Swan Point Cemetery in Providence. He would've been 21 years old at the time of his Gaspee shenanigans. His pension papers (#S.21984) state that he had no surviving wife or children at the time he died in 1835. His will was solely executed by a Thomas Burgess of Providence. He claimed his birthday as 4April1751. He states that "he was one of those who took and burnt the British tender Gaspee in Narragansett Bay in June 1772." Turpin Smith served a total for one year between 1779 and 1780, first as a Master's Mate beginning in June 1779 for seven months aboard the Rhode Island Navy frigate [probably the sloop-ed] Providence, Commodore Abraham Whipple. While aboard the Providence, the ship and two others met up with a British transport fleet and took 10 prizes, of which 8 were sailed into Boston. He then served about five months aboard the Massachusetts Navy ship Protector, 20 guns, Captain John Foster Williams. He was engaged in action on the Newfoundland Banks in both ships, probably to disrupt British and Canadian fishing expeditions in that area. The Protector met up in that vicinity with a British privateer commanded by an Admiral Duff, which blew up when her magazine exploded. In amended pension application Smith claimed that Master's Mate was a rank equivalent to the more modern term of "Sailing Master" and should be accorded the rank equivalent of a Lieutenant in the Navy. He was apparently illiterate as he signed his pension applications with an x mark. He pension applications were attested to by Stephen Wardwell, Deacon, and Henry P. Franklin, merchant, of Providence in 1832, and later by Samuel Young and Thomas Clarke who were both clergymen from Providence in August 1833. Turpin Smith was noted to be both blind and hard of hearing at the time of his application in 1832. The NEGHS database portal to Early American Newspapers gives us several ancedotes. In 1791 Turpin Smith was in command of a brig out of Providence that sank near Hispanola, all crew were saved. In 1792 he advertised for sale a dwelling house and store on Union Street in the West End. In May 1794 he had sailed into Providence from Bermuda. In January 1799 he commanded the brig Sally out of Providence. Between 1803 and 1813 he advertised for sale at his store next to Dr. Benjamin's near the west end of the Great Bridge, an assortment of crockery, glassware, and cheeses. According to the Providence Phenix of 14June1806 a new street leading northward from Weybosset Street and between the houses of Captain Turpin Smith and Captain Bowler was to be called Union Street (this article is a great source of early street names in Providence). In 1816 he began advertising a house and apartments for lease at Union and Broad Streets on the West Side. In 1822 Turpin Smith's crockery business had ceased and the location became the site of a shoe store. Finally, his short obituary was published 22Aug1835 in the Newport Mercury and probably other newspapers. LDS file search is totally negative for Turpin Smith. Gendex search turns up nothing, zippo, on a Turpin Smith and even nothing suspicious on the more common name Turner Smith. Searches of www.google.com gives us nothing new except what we have posted here. The Smith Distillery is of high interest, since we know many of those involved in the raid on the Gaspee were members of families involved in the Triangular Trade of slaves for molasses for rum for slaves. The name Smith also pops up in a search elsewhere on the Gaspee Virtual Archives among other Gaspee raiders. Thomas Swan apparently married a Smith at some point in order to be considered the uncle of Bishop Smith. Benjamin Page's mother was Alice Smith. John Brown married his wife, Sarah Smith, in 1759. Also, we note that Gov. Stephen Hopkins married his second wife, Ann Smith, in 1755, and a Benjamin Smith owned a shipyard in Pawtuxet Village during the times. But it turns out the the brother of Gaspee raid leader John Brown's wife Sarah is Job Smith (b: 24 SEP 1736), owner of the distillery. Turpin Tavern VI C 3 aka "Old Turpin House"
We also note, curiously, that the Turpin Farm is located just north of, and adjoining to, the tract of land owned by John Smith, as was a Turpin Tavern est in 1685. Note that it was common at the time to recycle names of children that had died in infancy. As noted above in Turpin Smith's pension application of 1832, all of his family had deceased by that time. Nothing is found on Ruth Rhodes or Samuel Rhodes in the LDS site. If we believe in guilt by association, then James Sabin, who owned the Sabin Tavern where the Gaspee raiders met to plot the details of the attack on the Gaspee in June 1772, married his second wife in August 1772 by the name of Anna Bicknell (1754), whose mother was named Martha Turpin (1718-1785), daughter of William TURPIN (1690-1743/1744) and Catharine JENCKES (1694). William Turpin was apparently a wealthy merchant in the Attleboro-Providence area. William and Catharine Turpin had ten kids, of which, seven were female. We don't know who the other four daughters married, if they did. It is highly likely that the Turpin Smith we seek is the offspring of Elizabeth Turpin (1715) and this _____ Smith. Since Elizabeth was born in 1715 in Providence, we can assume she married Smith sometime around 1735, and would've been available to have the offspring of Turpin Smith c1750. Birth and death records show that there were two children born with unlisted first names of a William Smith and Elizabeth Smith on 12 Aug 1755 and 02 Nov 1756, one of which died on 20 Nov 1759. 12 Aug 1755 as a birthdate would make Turpin Smith 16 years old at the time of the Gaspee attack; young, but within the range of what Ephraim Bowen described as "my youthful companions". Whipple.org does list several William Smiths born in Providence during the first half of the 18th Century. There are also 4 or 5 Elizabeth Smiths listed with no or incomplete dates in the RI Historical Cemeteries Database. Unfortunately, there are many inconsistencies in the genealogical trees, so we have little to do until the Smiths and Turpins work out their trees with some accuracy before proceeding further. A John Smith was listed as a member of General Assembly from Providence c1773-1777. 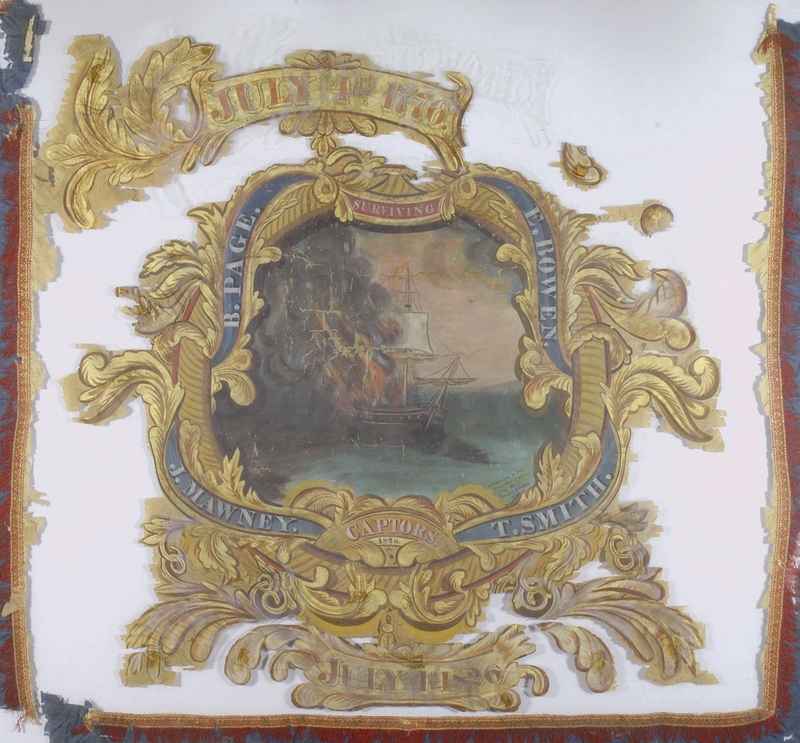 The Gaspee Days Committee recognizes Turpin Smith as a true American patriot for his role in attacking the HMS Gaspee in 1772.